I know it is not worth a lot of money and you can find a lot of Japanese Chocolate Pot items. Photo to right shows our Japanese Kutani Chocolate Pot, perhaps? I paid $65.00 at an Estate Sale. But it is odd the mark on the bottom of each piece that intriques me. 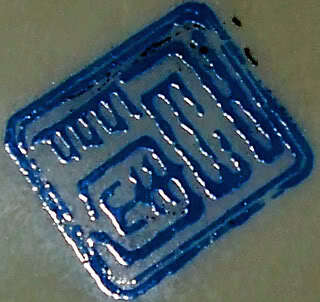 It looks like a stamped mark, but not all stamps are exactly alike. Some lines are wider, longer or shorter. I was told a couple of different things, which makes me wonder even more about the history behind this pot. 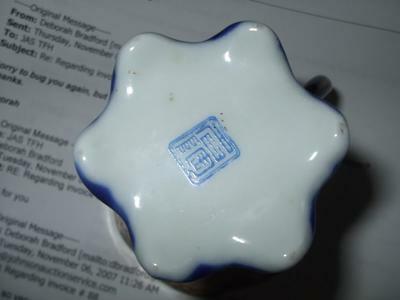 I can find nothing like the mark, but the Japanese Chocolate Pot workmanship looks like Kutani porcelain. It is very thin porcelain. When you hold it up to the light you can see thru it. It has raised dots on the outside. Even though the makers mark on each piece in this picture looks like a dark blue, it is actually a light blue. 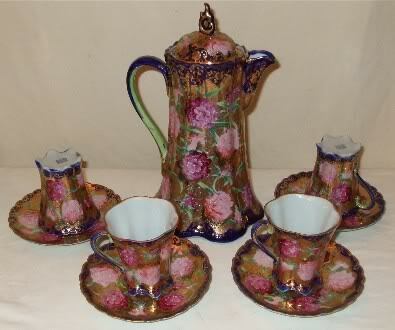 Someone told me the Japanese Chocolate Pot was dated to apprx the 1930’s and someone else said late 19th century. So while this is not unique, it is just a strange thing that no one seems to know anything about it other than it is Japanese.